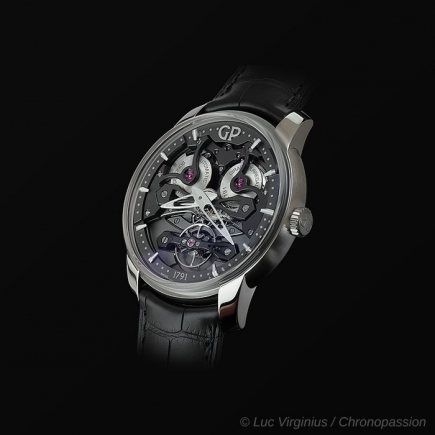 girard perregaux | 125'000 € Tax inc.
A contemporary reinterpretation of movement architecture designed by Girard-Perregaux in the nineteenth century, the Neo-Tourbillon with Three Bridges and DLC titanium case definitively places the Manufacture in the third millennium and puts the watch mechanism on the level of kinetic art. Daring has always been the watchword of exceptional people who defy established rules to create new paradigms by sheer force of conviction. 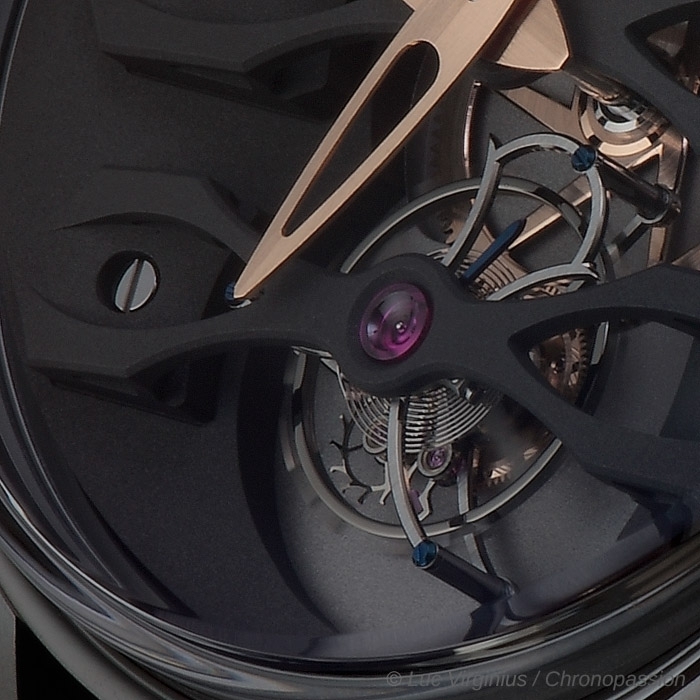 Iconic since its inception, the Tourbillon with Three Bridges has imposed its unrivalled and minimalist architecture on the whole profession for the past 150 years. At the dawning of this new millennium, the time had come to make a change and uphold the magic of a sustainable idea. 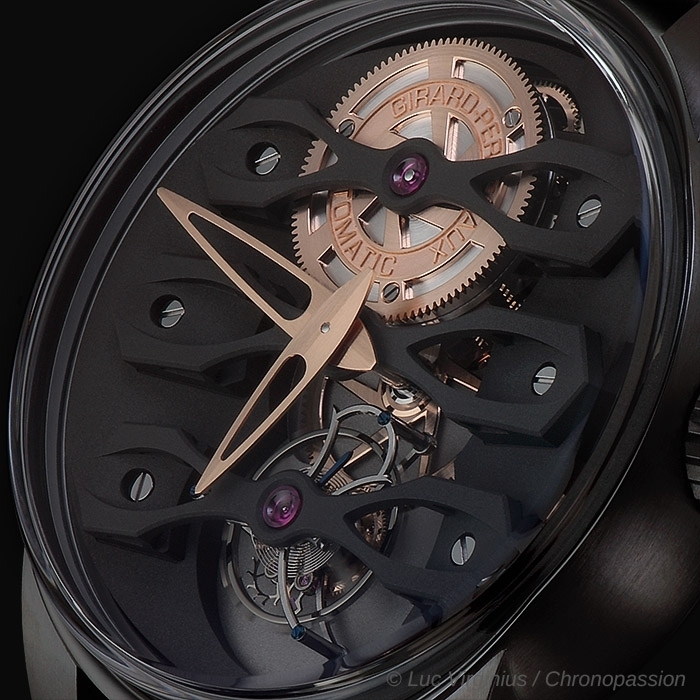 With the Neo-Tourbillon developed by the Manufacturer's watchmaking teams, form has evolved in tune with contemporary tastes, but the architectural principle of perfection, which focuses on the essentials, remains just as powerful. Designed with the will to always move forward in compliance with the values dear to watch enthusiasts, the Neo-Tourbillon with Three Bridges endorses the technological potential mastered by the Manufacture, honouring the past and proving itself worthy of the future. 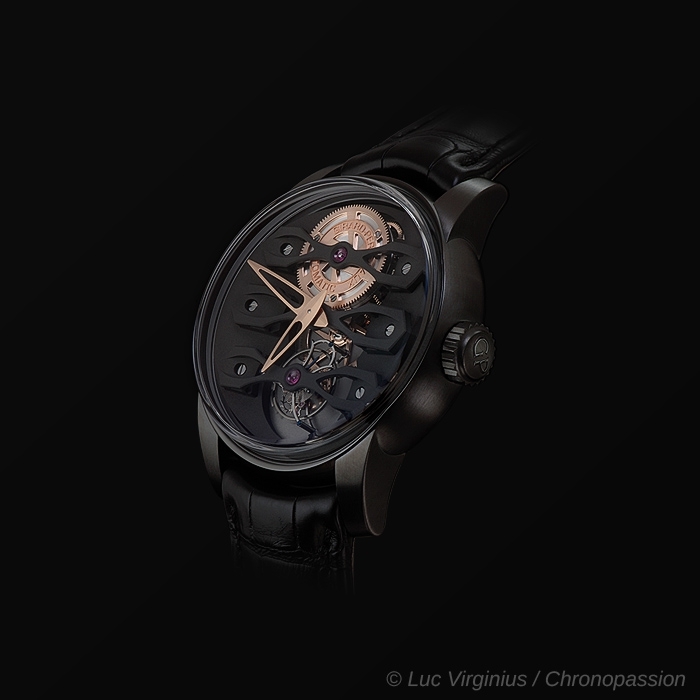 One look is enough to understand that the Neo-Tourbillon is primarily the expression of a stylistic principle around which it is possible to compose without ever deviating from the blueprint. The new aesthetic used to magnify the ethereal mechanism plays with the graphic codes of the era to attract and maintain attention. 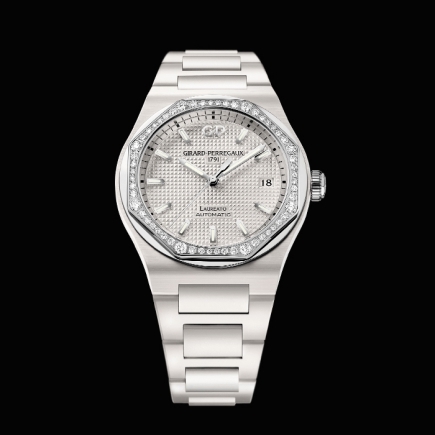 It also uses the best that avant-garde technology and materials have to offer. 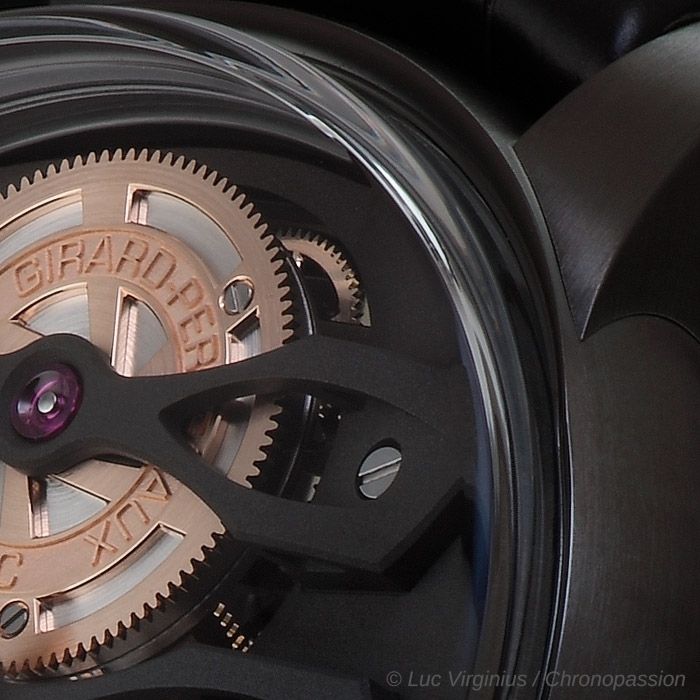 The new bridge design, through its curves, emphasises the omnipotence of this dynamic as expressed in the geometric design of bridges in the watch presented in 1889 by Constant Girard-Perregaux at the Universal Exhibition in Paris, which went on to win a gold medal. The structure of the bridges, openworked in such a way as to give an insight into each detail, is an ethereal celebration of the mechanism. 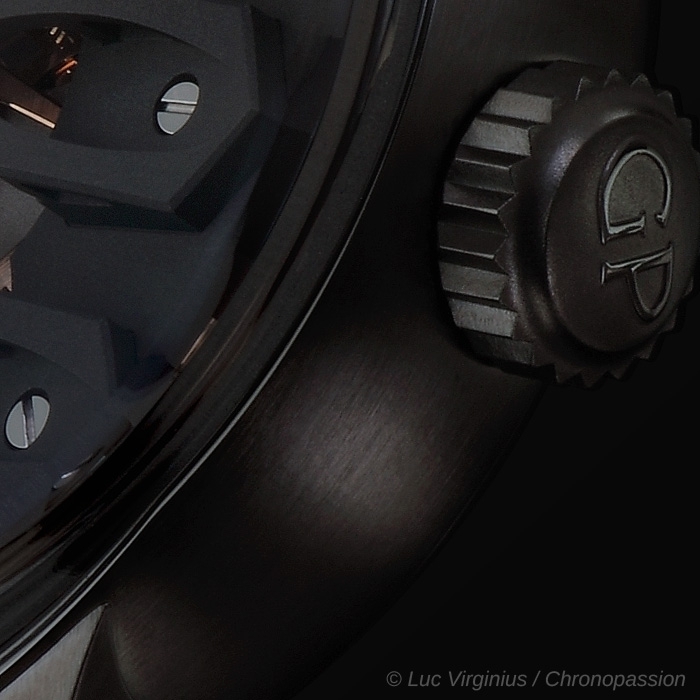 Machined in titanium, a metal nearly half the weight of steel, each bridge is sand-blasted and then PVD-treated to give a materiality to this fine construction, which is a tribute to contemporary architecture and sometimes defies the rules of universal gravitation. 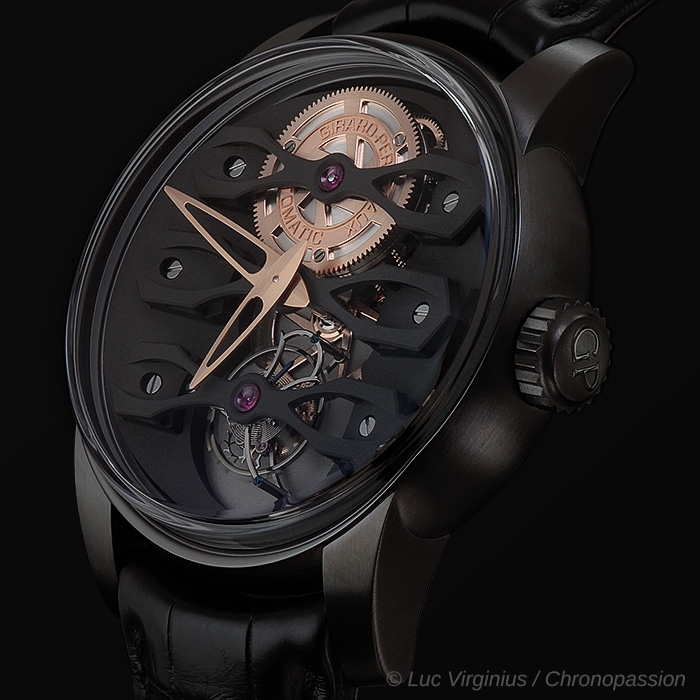 Yet this is quite logical as the Tourbillon, supported by its sculptural arch, performs a timed revolution that has the fascinating property of releasing the balance spring from the effects of gravity. 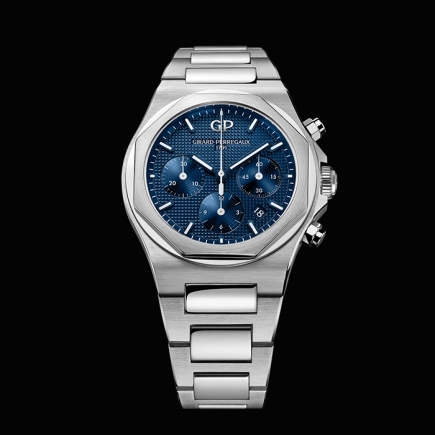 To maximise the effect of depth and catch the eye - and thereby the soul -, engineers and watchmakers have reworked the plate, also sand-blasted and black treated, in order to concentrate perspectives and light in its centre. This centre is contrasted and fractal, formed by a succession of three intertwining light grey circles. 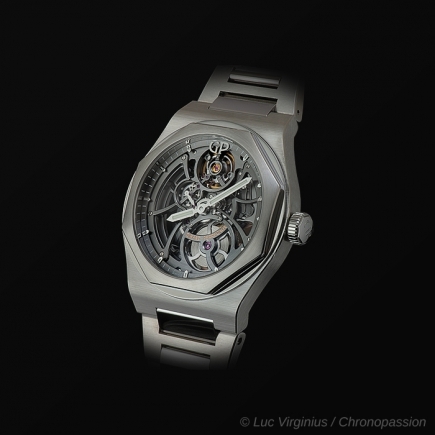 The sophisticated plate is designed like a frame and protected by a super-convex crystal dispensing the need for the case to include a bezel and thus emphasising a very large and magnificent Tourbillon cage. 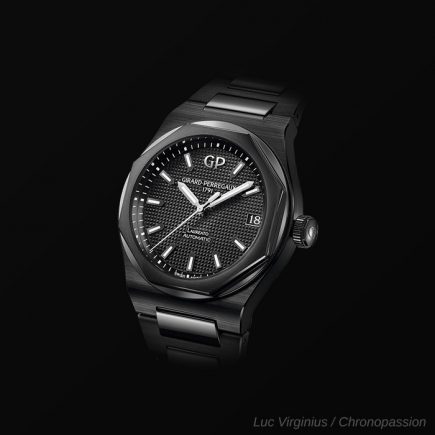 Also made in titanium, as in traditional steel versions, it offers fine watchmaking finishing with "traits tirés" surfaces and hand chamfered ridges. Performing a full rotation in one minute, this 14.44 mm diameter part, comprising 80 components and weighing only 0.25 grams, takes with it in its timed circle a balance spring adjusted by a set of gold screws, oscillating at 3 Hz through a spiral with a Phillips terminal curve. 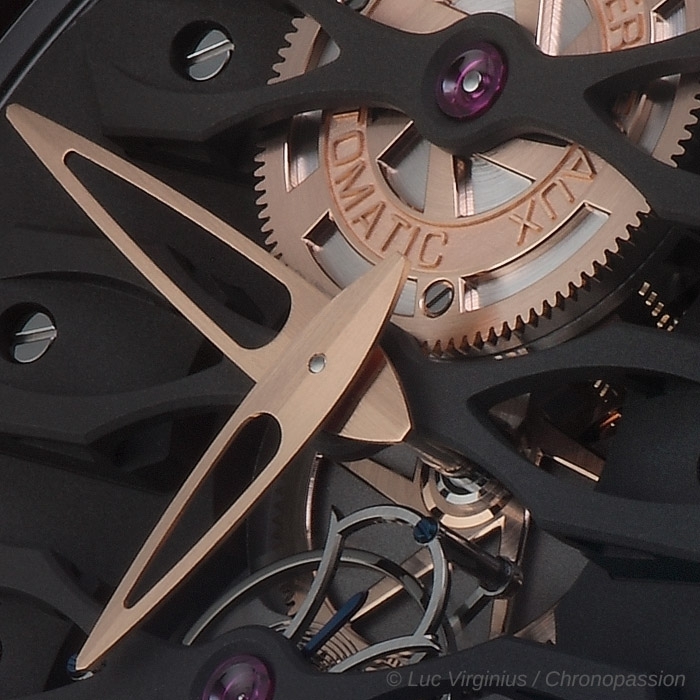 As a perfect equation, the calibre of the Neo-Tourbillon with Three Bridges has a striking mathematical construction. 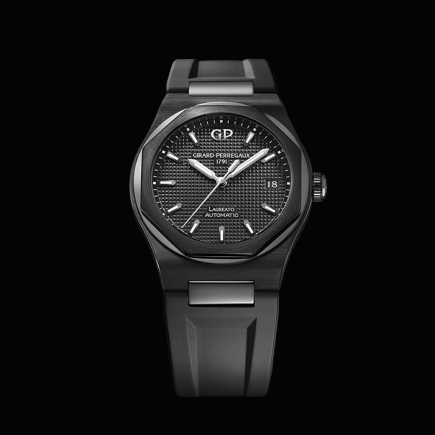 A fleeting observation could suggest that this movement, called the GP09400, consists of only a few parts. In reality, it takes 245 to bring it to life. 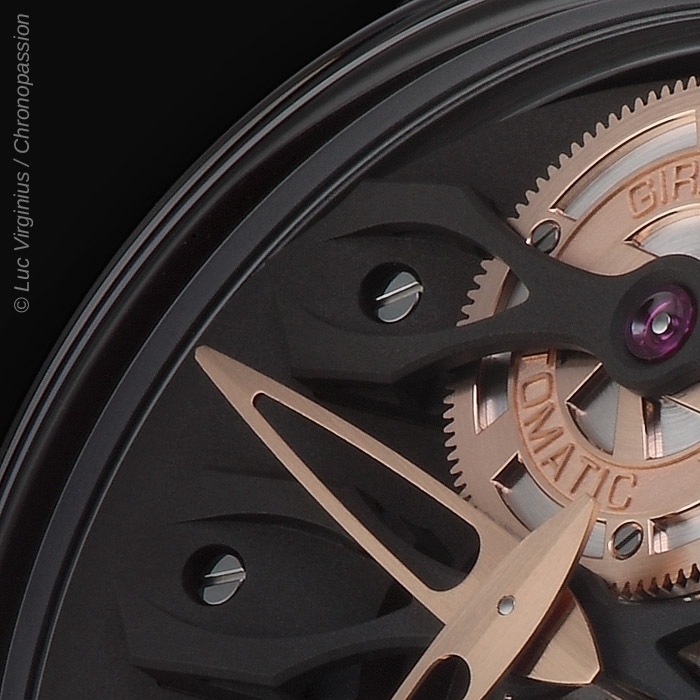 Distributed into subsets, they facilitate servicing of this heart finished to fine watchmaking standards. 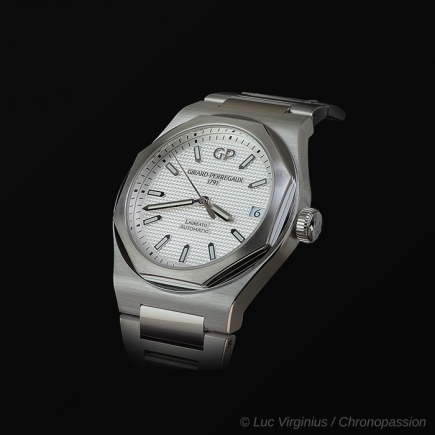 It is also the result of a large-scale development involving exclusive technical solutions, for some selected options such as automatic winding. 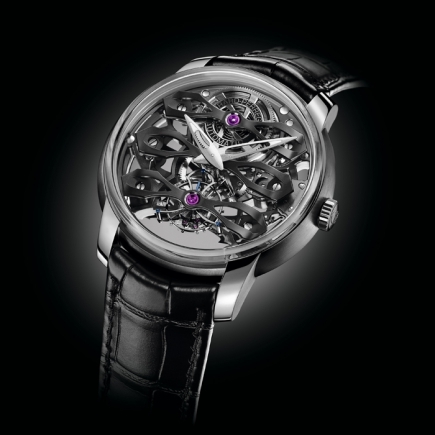 Here for example, the platinum rotor that rewinds the barrel spring in one direction is placed beneath it and not around its drum as applied by the Manufacturer on certain other Tourbillon with Three Bridges models. 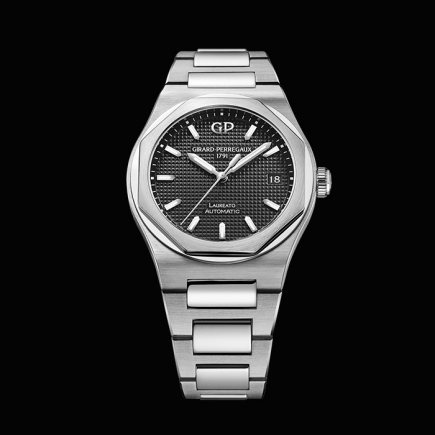 This reviewed positioning guarantees the watch a power reserve of 60 hours by the use of a larger diameter barrel drum, capable of holding a much longer spring. 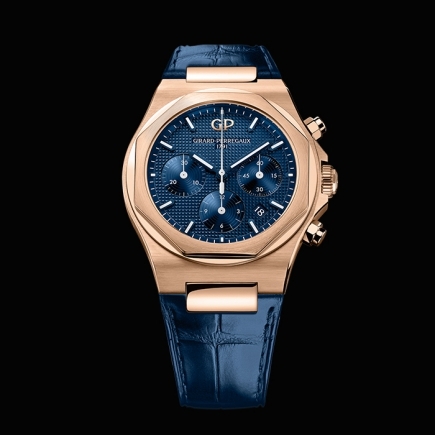 Aware of the stylistic choices made, watchmakers have removed the teeth on the drum and replaced them with a screwed wheel. Engraved and chamfered, this wheel has six arms, assembled like turbine blades, to form a unique décor whose pattern is repeated as a kind of signature on the other visible wheels in the movement. 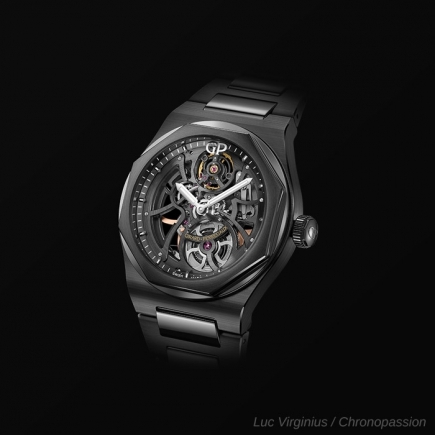 Obviously, the Neo-Tourbillon with Three Bridges adorned with a 45 mm case in titanium DLC, water resistant to 30 metres and worn on an alligator strap has a transparent case-back. 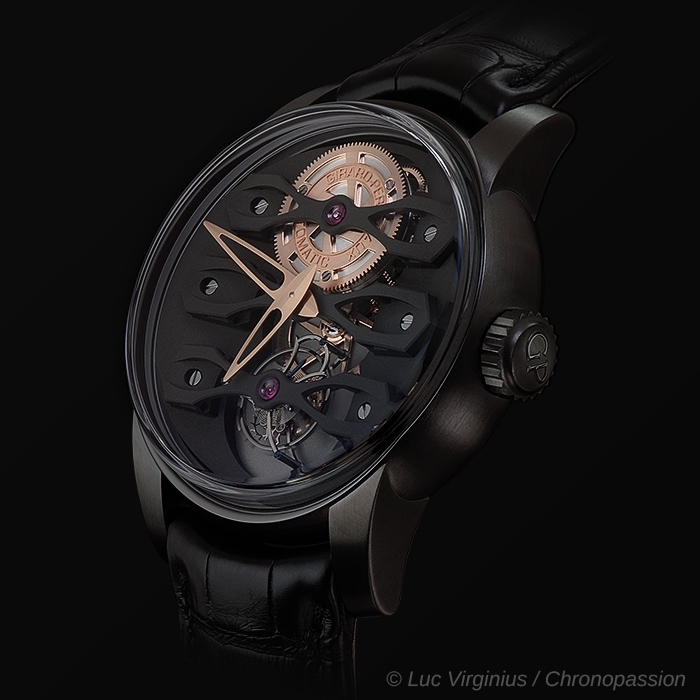 It allows enthusiasts to get to the heart of the components, some of which have been specifically designed to capture specific shapes of the Tourbillons with Three Bridges. Thus, on the case-back, an arrow-shaped bridge completely crosses the movement. 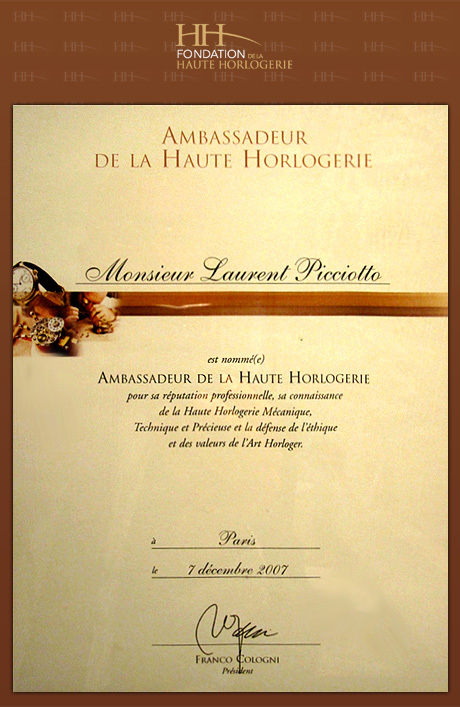 Likewise, the ratchet at 12 o'clock reproduces the shape of a lyre and all the parts of the calibre, in addition to playing with multiples of three, have contemporary finishes treated according to the strictest traditional watchmaking rules. Barrel: upper wheel of the barrel skeletonised beveled, polished, circular grained and engraved.